Rich in selenium, zinc, folic acid and B12 vitamins, mussels are a personal favorite. Last Saturday, I went to the supermarket’s seafood section and saw a huge crowd milling about. “Don’t tell me they’ve raided the mussel bin already,” I mused. Upon closer look, I was relieved. They were stuffing their plastic bags with live lobsters, plucking the creatures from six or seven large crates filled to the brim. I approached the counter and asked if they had any mussels left. “Lobsters?” The young man asked. I shook my head, “No, mussels.” He gave me a funny look. Here was an unruly crowd getting excited over lobsters and I’m asking for mussels. “Over here.” The sales clerk pointed to an area behind him. I spotted two lonely bags and I almost changed my mind. I was worried that they had been there for some time, but the tag had an expiry date of about 3-4 days more so I grabbed one bag and headed for the cash. I could almost taste the mussel broth that I enjoyed as a child back home. Fact # 1: Mussels must be cooked upon purchase. They will hold in the fridge for up to a week, but I would not wait that long. I cook them the next day, at the very latest. Fact # 2: Most of the mussels we buy from seafood places are usually farmed, as opposed to wild but they will still smell “like the ocean”, as some writers put it. Fact # 3: Mussels have a “beard” sticking out of the shell. This should be pulled out. They must be rinsed in cold water, at least three or four times. A good brushing is also recommended. Fact # 4: People steam their mussels to open them. After that, they add their wine or make a sauce. My favorite mussel recipe follows. It’s a very basic recipe. I don’t steam them; instead I add about 6 cups of water to make broth. The taste is tangy and gingery. 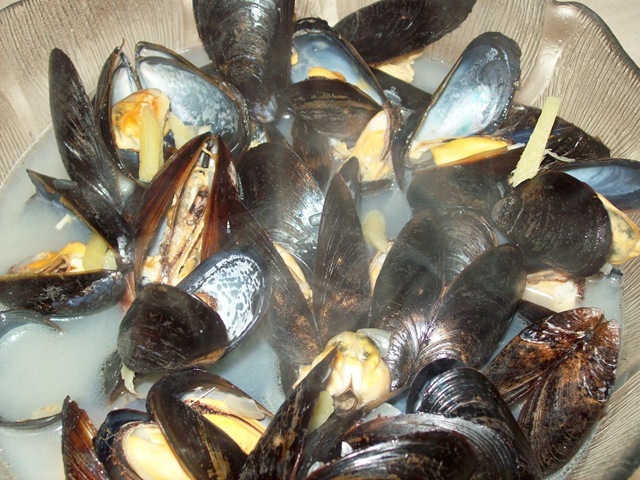 1 bag of mussels -about 2-3 pounds – (make sure they are tightly closed when you buy them). Wash mussels thoroughly with cold water. Remove the “beard.” Give mussels a good brushing. Chop your onions, crush your garlic and cut ginger into thin strips. Heat oil for 2 minutes. Put ginger, onions and garlic and sauté for about 3-4 minutes. Lower heat if garlic begins to burn. Pour 6 cups water. Allow to boil. Add your mussels and cover pot. Lower heat and let the mussels simmer (about 15-20 minutes). Open pot and inspect mussels. They should be open by now. Orange-colored flesh indicates mussel is female; a whiter tinge, male. Serve in a soup bowl. You can garnish with parsley, but this isn’t necessary. In my next blog, I’ll post mussel recipe # 2 – Mussels Provencal.